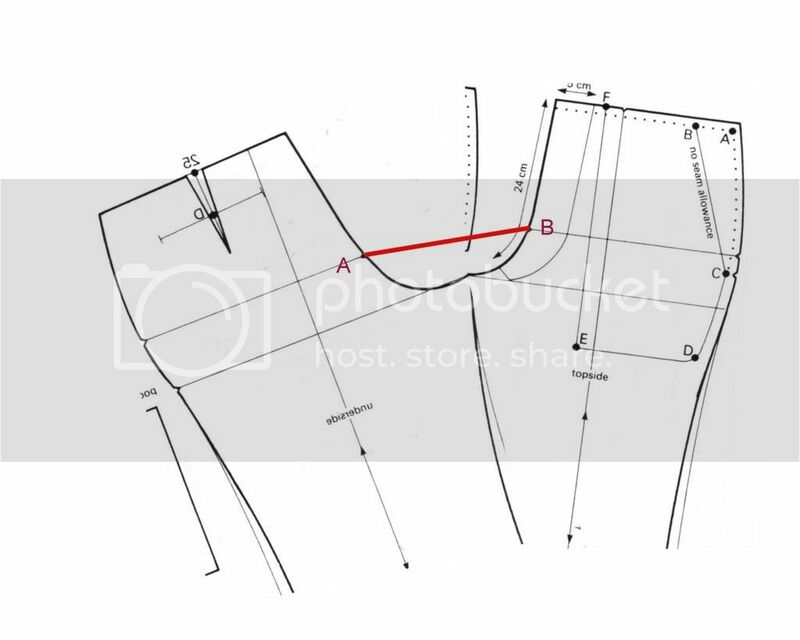 I'm trying to get a really slim cut pant pattern together but I'm keep coming across the same two problems: crotch curve length and length around the seat. I understand that most here would not appreciate a super slim cut pants so much but I would still appreciate if anyone could give advice other than "wear pants that fit" etc. I drafted using this system here: http://www.cutterand...showtopic=2181. but I found the fit still not to be slim enough. The attached picture shows in black the original draft. So the problem is how can i make the length around the seat and along the crotch curve generous enough while still being able to slim the legs down. If I take the legs in I lose length in the crotch and as a result have to scoop it out more which only leads to less width in the seat because essentially I'm taking fabric away. The only idea I've come up with is to add to the hip curve at the back but then that curve has to come back in drastically to keep the legs slim. The final result being of that which is displayed with the red and blue lines. It's no easy task to say how to solve this I understand so I'm not expecting anyone to magically solve my problems. I'm just asking for anyone with an idea to throw it out there tested or not as I've been banging my head against a wall to try to work it out and I am yet to come up with a satisfactory solution. Any help is great thanks. hehe Schneidergott does it in another way. Yes, you manipulate a lot with the knee width. That gives small thighs. You can even do them higher up. 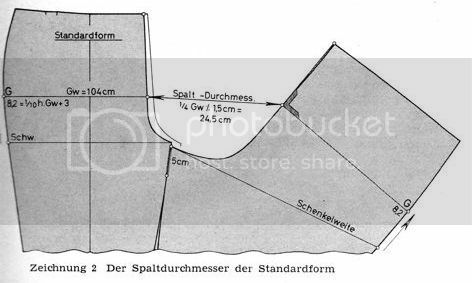 But be careful the curve of inseam - knee to back crotch can not be to curvy The trouser can loose the "Schluß". I thought more about a jeans - a tight crotch slim legs. But I'm doing moslty ladies pants. Sorry! Edited by posaune, 09 July 2012 - 04:15 AM. I once read in an old book that the trick is in the knee width. With baggy trousers you need a wider crotch (in Rundschau it's Spaltdurchmesser) because when you put the inside leg seams together it doesn't open up that much. The smaller the knee width the wider the distance A to B. So my suggestion is to settle the knee width and hem first and then adjust the crotch accordingly. I think there is much more to reshaping the whole upper portion of the body including but not limited to CF and CB lines. It is tricky, and i think the final shape is much more like jeans than dress trousers. More like jeans, meaning a large hip curve both in back and front panels with a straighter CB curve? I'm going to try a few things with the pattern today. If I work anything out I'll post back. here I have a comparison of a jeans (black) and a normal slim pants with the same measurements. You can see where they differ. I've cut myself a toile a long time ago to test it, and found it quite slim. You don't have to make such a high waist, you just chop off what is too high, and take in just a tad at the waistband level to keep it in place. The back does look a lot like those jeans patterns here discussed. No, a more angled cf and cb and less hip curve. The opposite of what you are saying. Have you looked at or taken apart a pair of jeans? The angles are greater. Edited by Terri, 09 July 2012 - 09:43 PM. That fitting guide was written when men wore tight-kneed trousers regularly. The author Lehmann reiterates what some of the other pros have suggested on this thread. I highly recommend Lehmann no matter what system you use to draft. Read through the trouser section a few times to fully understand the theory behind fitting tight trousers so they are comfortable, look smooth and don't rip apart too soon. If you are knock-kneed or bow-legged, those problems are more apparent in tight trousers and more difficult to fix. Many cutters have many solutions elsewhere in the forum if you search. 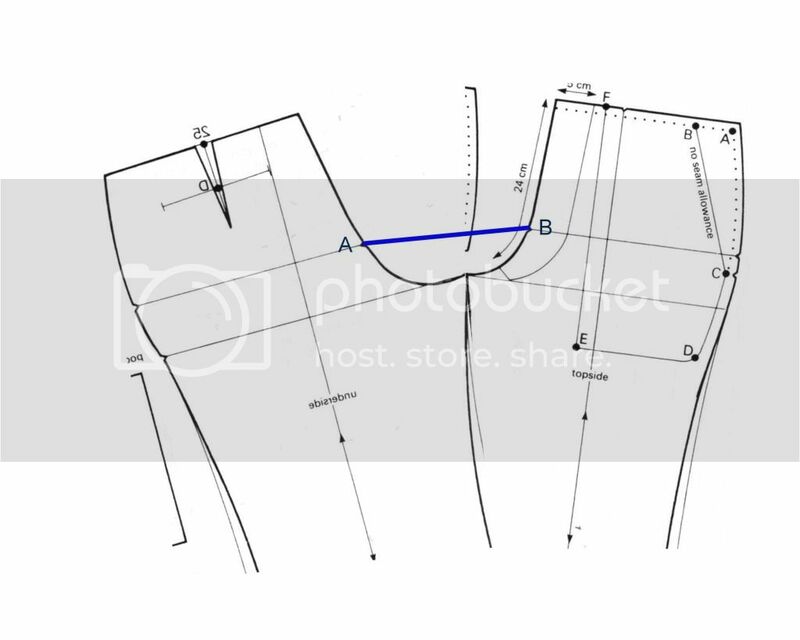 Show us pics of your basted fitting and we can help more with how to adjust the pattern. Ok so everything in here has been really helpful, I've been through a few iterations of the slim cut pants based on the different resources here. I seem to come up with the same issue every time. If I reduce the leg from the knee up through the thigh on the inner leg curve the crotch curve length is reduced. Not leaving enough room for the nether regions. 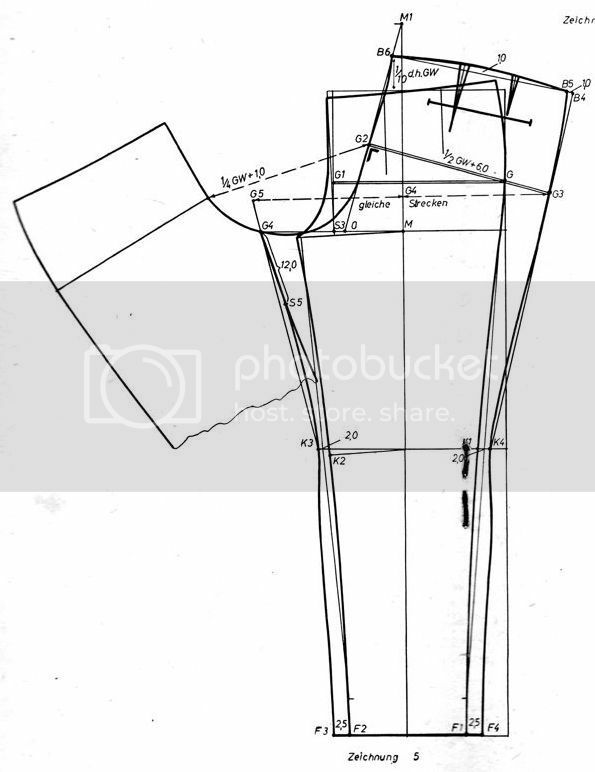 If I reduce the width around the thigh area along the outer seam there needs to be a super strong hip curve at the top to still allow for the buttocks and hips which contradicts what posaune said: Less hip curve sharper CB CF angle. Every system I use I end up with an acceptable pant but nowhere slim enough in the upper leg. I'm going to keep working on it when I've got it sorted I'll be sure to let everyone know. I think everybody will be interested by your findings. But just so you know, in the XIXth century, there has been a fashion for maybe a decade or slightly more for extra-slim trousers. I had been wondering for a long what was the secret of these masters to cut so tight-fitting trousers that were still wearable. I found the answer a few weeks ago : they were cut in a knit like jersey. The book I read this in explained that only knits had "give" enough so that the trousers could still be worn. A woven cloth didn't have enough stretch to walk in them. Today's extra-slim trousers in RTW fashion are all made in a stretch fabric (stretch denim or anything else with 2 or 3% lycra in). I've experimented myself, by accident, cutting trousers in stretch (I wasn't carefull enough when I bought the cloth). I cut them with the same pattern I use for slim cotton drill trousers, and when I tried them, I had to remove 4cm of stride in the crotch. I tried cutting cotton drill trousers with the updated pattern, and I just couldn't walk with them (I will add a gusset so I can wear those trousers since I like the fabric and I don't have more of it). I may be off, but it would seem that you would just need to take ease out of the side seam all the way down. With less above the T-C-L line (if you want it looser in the hips and seat). And more below the T-C-L line if you want the legs to be slimmer. However, I imagine you have to make the transition gradual to avoid some weird effects. Interests:Tailored Suits and Swimsuits, Recuts, Leather, design, recycled fabrics, restoring antique garments. Have you tried adding to the stride, taking off the hips, and making the front legs much more narrow than the back legs, keeping plenty in the back rise. Make them hip huggers as well, then you should have it. I'm trying a bunch of stuff right now. I want to deal with a couple of other patterns and things that are not giving me as much trouble as this one is. But as soon as I've finished with all that I'll be back to it probably within a week. After which I will be sure to come back with I think 3 different approaches to the slim pant, one of which is with a curved leg(in the attached picture). Thanks for everything so far you guys are the best. Don't waste your time with curved leg patterns. The correct answer lays in the finding of the right crotch diameter, curved inside seam of the back trousers, bigger hip bow and slanted fly. I haven't abandoned this thread I have been working a slim pant on and off. I'm at a point now where I'm wondering if I have an unreasonable concept of what a super slim cut could fit like. The main issue being that i cannot give a sufficient crotch curve length without adding too much to the thigh area. slimming down the upper leg reduces the crotch curve to an unreasonable length that can not be worn with any type of comfort. 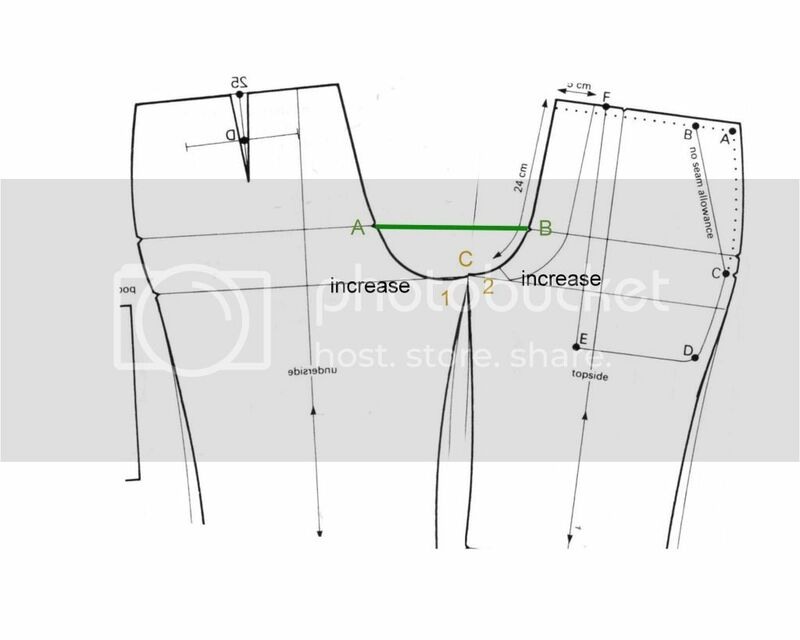 another issue is when slimming down the thigh area while keeping the crotch curve at a longer length it makes the inner thigh angle too sharp to even make a crotch curve it basically straightens the curve out. I'll keep working on it. Perhaps try to reverse engineer your thigh diametre from knee to crotch, in say, 5cm horizontal cross sections? Well I could but that would not really help the issue as I have no problem achieving a slim fit in the leg alone. But when it's time to attach each single leg 'tube' together the crotch curve is lacking in length but the legs fit perfect. 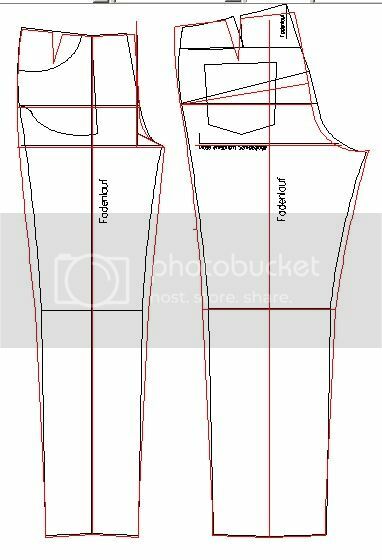 or going the other way fitting the crotch curve to fit right then adding the legs leaves too much slack in the upper thigh area as the inner and outer seam must flare out to meet the waist. Though I must say I have had no problem at all producing a super slim fit with 100% non stretch fabric for women. Honestly the problem is, can a man with a generous 'package' wear a pair of slim pants without having said package visibly dissected? Sorry if that is too crude but I have seen it done without this unfortunate problem happen and for the life of me I can't work how it's done. Edited by vincent, 22 August 2012 - 03:48 PM.